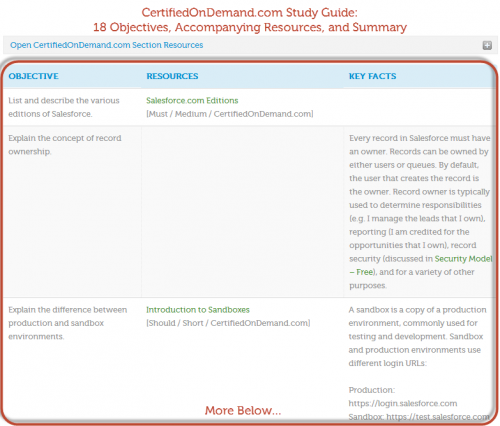 What is a CertifiedOnDemand.com Study Guide? A CoD study guide is a structured set of objectives, resources (articles, videos, blog posts, etc. ), and key facts (takeaways from each objective) designed to prepare you to pass a Salesforce Certification exam. One of the biggest challenges with learning Salesforce is one of information: there’s simply too much of it. The Salesforce User Guide is 5500+ pages, there are thousands of videos on the Salesforce YouTube channel alone, and hundreds of blogs. Processing the abundance of information is time-consuming, and it is often difficult to understand what’s truly important to know when preparing for a certification exam. Another common challenge is identifying knowledge gaps (you don’t know what you don’t know). For example, when I took the Salesforce.com Certified Administrator exam, I didn’t know that account teams existed (much less what they did), and I spent a lot of time preparing for the exam. To dramatically reduce the time required to prepare for a certification exam. To dramatically increase the likelihood of passing a certification exam. To present real-world challenges in safe learning environment. To serve as a reference guide after you’ve passed your certification exam. The study guide provided by Salesforce.com is very high level. Contrast that with the amount of information available, it’s very difficult to quickly identify what you need to learn and study. Let’s look at an example: the Salesforce.com study guide has 2 objectives for User Setup, while the User Setup & Login Process – Free section on CertifiedOnDemand.com has 18 objectives, exercises, and a practice quiz. If you are preparing for admin certification, this guide is for you. I’ve gotten feedback from users that have taken Salesforce.com training, used Salesforce.com premiere training, study groups, books, and more. Regardless of your prior training and experience, CertifiedOnDemand.com will help you prepare for certification. Get started for free. Simply Sign Up, then visit Getting Started – Free. Visit the FAQ if you have any additional questions. Passed the certification John! Thank you for putting this site together as well as the one on one’s. Much appreciated. Stay blessed! That’s awesome – congrats on passing! Hi John – i cleared the ADM201 test today, thanks to your website for getting some concepts clear. Are you planning to put up a similar course material for ADM 211 or DEV450? Hi John,,I plan to give a certification in ext couple months.I had started studying from your classic version of website. But now I see you have developed a new website. In the classic version some of the content are free but in the new version we have to pay before we start.Also it says some of the content is not complete.So I am little skeptical about enrolling in your new website.Could you explain how is your new website different from classic one and why would you recommend the new website. Almost all of the restricted content from this site has been moved to the new site. The classic version is primarily objectives with external links (which have been moved to the new version). The new version emphasizes video content over objectives – however, not all of the video is complete (yet). The new site also gives you the ability to track your progress, includes screenshots in the objectives (for the completed content), and lots of additional quizzes. The final price of the new product is going to go up – early access reflects that all of the video content is not complete. Your new website sounds promising.Since its still in progress,for the part which is not available now..do we need to refer to the classic website?And if I register for the new version now….will I still be able to access the videos when they are complete or I will have to pay for them again? You can refer to the new version will refer you to classic where needed – no account is required on the classic site to use the new version. If you purchase the new version, you will get access to all content that is added as well. I want to have Some knowledge about the usage of custom setting and connected app. I know it’s not much related to the 201 certification..but i want to learn about it …if you can help me gather the knowledge..
Also want to update my email what is sign in to Certified on demand..can i change it to my other email as i am not using the one i have sign up here..
Hey Tejal- can you reach out via the support form with specifics? Thanks! Sorry I neglected to say.. I passed the admin exam a few months ago. Your site is great. Thanks! Very good. Do you guys have latest service cloud consultant material for certification? Hi John, I took my Admin cert exam yesterday, and passed on the first try! Thank you so much for this site. There are so many features of Salesforce that I wouldn’t have known about without this study guide, since my company doesn’t use many of the Sales and Marketing features. I will definitely recommend this site to anyone looking to study for the SF Certified Admin exam. Congrats and welcome to your new life as certified Admin. I am giving admin exam on 27 dec , can you guys please give me some guide or practice questions i should consider before going for a exam? It would be really nice! I passed my Admin Exam using this site. Thank You for creating it!!!! I now want to prepare for the Dev Certification, are there any plans to expand and create study guides for the dev exam as well? Hi , could you please share your mail address, as i would need certain guidelines on the exam . Any Idea when the new site will be live? Anybody has community cloud consultant dumps? Sorry, wrong site, we don’t share “dumps” here, but you are welcome to ask legit certification questions. I passed my Admin Certification last Friday. Thank you. Do you have a course for The Salesforce Certified Platform App Builder credential? That’s awesome, congrats! Not yet but I will likely be working on it next year. I would like to take the Admin Certification test sometime next month. Should I wait until CertifiedOnDemand.com Version 2 comes available? Or can I get enough value from the current version in order to pass the exam. Please advise as soon as you are able. Thanks for all of the great study material. Passed the exam after using this site! I had registered for Salesforce admin course last year when the latest version was Summer 2017, however I did not get chance to study the material till this year, but now the version has changed to Winter 2018(latest). I want the latest videos and study material for the course. As a registered user how do I get the latest material? I also saw that there is beta version available, but it asks to signup. Since I’m a old registered member, don’t I get access to beta without again signing up? I understand the Beta version covers Winter 2018? Is my understanding correct? I have a subscription to the classic site but waiting to start using the new and improved site. Should I sign up for the Beta site if I’m already subscribed to the classic site? Or will my current account be updated automatically once the new site is live? Your account on CertifiedOnDemand.com will be transferred to the new site once it is ready. You can create a second account on the beta site to use that content today. Expect an official announcement in the near future around a full site migration plan. If you purchase today, you will get upgraded! passed at first attempt —- your site has the full credit ! Hello. Did you just study content from this site?? Thanks for the efforts on the web-site, just passed the ADM201 exam on Friday. Just passed my ADM 201 test today. So proud!!! Congratulations! Can you share with me the supports with which you have prepared. That’s so awesome. Congrats on becoming an MVP Carlos, well deserved. I’m so glad this site has helped you get there! What can an admin configure for users on the search results page? John, I wanted to thank you for this wealth of information! I spent a week going through Trailhead tutorials and bouncing around from site to site looking for a more centralized and comprehensive collection of training and studying material. That’s when I found yours. I spent a couple years doing some admin work, but only in Service Cloud, and when it came time to study for the admin exam I was, quite honestly, a bit overwhelmed. However, I used your site as my primary study guide / source and put in about 40 hours of studying in two weeks and was able to pass the exam on the first attempt! Thank you for all you’ve done and do to assist people with their goals! Awesome thanks for the feedback – and congrats on passing! Thanks John for putting together a great learning site. Invaluable! Passed my Admin certification exam yesterday. Thanks for sharing and congrats on passing the exam! I just passed the ADM 201 certification test on the first try. This site really helped and was well worth the money. Passed the exam on my first try! Thank you for this guide!! In addition to your quizzes, I also found the practice quizzes on here to be helpful: http://sfdcstudy.org/adm-201-certification/adm-201-quizzes/ . Many of the questions were verbatim or almost verbatim to what was on the actual test. Awesome, congrats! Not a good sign to find verbatim questions, these sites usually get taken down. I got my exam this website helps me a lot. I’m not at all from background of software. I’m an instrumentation engineer working in nuclear industry got interest to learnt I learnt and passed the exam looking for an opportunity in salesforce administrator. Could you please provide any Dummy/Test data for a ORG for SalesForce dev account, for practice. Hello, John. Thank you for putting together this amazing and in-depth study guide. I passed my ADM201 on the first try. Worth the time and investment. I know you don’t have any resource for the platform app builder but are you able to recommend any other, please? I cleared my Admin 201 exam today. hiii could you please tell me how to start preparation for admin 201 exam i am very confusing how to start my preparation . please tell the way how you prepare for certification exam thanx in advance. I passed my exam on Saturday on the first attempt! I don’t have work experience with Salesforce, but have been self-learning the platform via Trailheads for the past 6 months. I dedicated the last two months to diligently study (about an hour 6 days a week) for the admin cert using CoD materials alone. I’m excited to tackle the dev cert in the coming months with your new training materials! Thanks for all your efforts, John. Hey John, thanks for this guide. I passed today and got my certification. On to App Builders next! What I took from the exam, it was VERY record type heavy. Not sure if this was just coincidence, but there were at least 5 questions that referenced them. Awesome work, congrats! I’m not sure exactly how the exam pulls questions – that weighting sounds very heavy but it could have just been luck of the draw. I took the exam on Saturday and noticed many questions referencing record types as well, so make sure you know how they work and what they impact! Noticed that there was some identical questions found on flashcard sets in the exam. Hi John, Are process builder, flow and lighting covered in paid course material? When I went through free courses, I didn’t come across these topics. I believe we need to study these for summer 17 exam. Please confirm. Thanks a lot for the great site. with confidence that you are going to pass. I’ve been sfdc user for the past 2 years and admin for the past 2 months. I booked the exam a week ago and got CoD, I only used CoD for preparation (30-40 hours) and passed with 76%. There are 3 plug-ins I used to speed things up. One speeds up any HTML5 video, I probably saved 30% of my time with this. One helps you speedread through lots of text at a stable and higher than average words per minute and one reads out text when I end up getting bored or know about some stuff but want to listen through. Good job John, this is impressive. Thanks for the best Study guide resource on the web , It helped me alot to get certified last May , After some online applying got my first SF job as a Senior QA Salesforce Engineer , As i got 7 yrs Software testing experience . I am looking to shift my career to be Salesforce Admin soon , could you guide me one more time on this. Thanks for your site. I passed the Test this past Saturday!! John, thanks for the great resource. I passed the Admin exam. How would you suggest I study for the Sales and Service Cloud Certs? Would the material here cover that as well or do you have other suggestions? I passed the admin exam last week and I just want to say thank you for that. The CoD site was the only guide I used for my study. I passed on the 1st attempt and only took me 32 minutes to do so. Congratulations! What was your prior experience with Salesforce? Would you mind sharing if you reviewed all the material on CoD; including the material categorized as “must”, “should” and “could” in the 8 days that you studied? Yes, I reviewed all the material in this site. No exceptions. Of course there is some material that you just look over, without much depth. I have 4 years of experience in Salesforce, but only with topics of Sales Cloud, not Service Cloud, Analytics and most of the Worflow and Approval. Just wanted to say thanks so much for preparing this guide. I found it super super helpful in organizing my studying for ADM 201 exam. I passed today,by the way. I struggled with a few topics(Service Cloud was probably the biggest one, other ones were Activities and Content and Folder Management), but that was due to my studying and not your content. That’s awesome thanks for the feedback… and congrats! I’m registered for my exam in August and just received a note that the exam will be updated for Summer ’17 with a shift in focus and weight on sales and marketing applications. Will your training materials be updated soon to address these changes? Would also be very interested in this, as I was planning on registering to write the exam around the end of August. That might push things out? I will most definitely be updating materials to stay in line with the exam outline provided by Salesforce. I am also working on new video content and some other cool site updates. That’s great to see that the site will be updated following the changes. Could you clarify how existing users will know what is different? As in, I have made my notes using your website and others, but how will we know which changes are new? Will you put the changes in italic? Thank you, your site is great. I passed the admin exam thanks to your site in March. Thanks! How do you suggest I prepare for the advanced admin exam? I am not such a fan of trailhead, but if you were offering a course I would sign up today! Just a quick question – How long did u take to prepare for the exam? Thank You John for your reply. I am looking at ur videos for studying. Is that it or am I missing something here? I just passed the certification today and would like to let you know that your site helped me a lot. Thank you for putting this together! Awesome thanks for sharing – and congrats! What’s the difference between the sales cloud console and the the service cloud console ? HI John, thanks for study guide certainly well put together course and I passed my admin exam last week. 1. How can we change the font color when inputting information into a Rich Text Format (RTF) field? Also, how can we create a report that shows the red font? 2. When I copy and paste from a Word document to an input screen RTF field, how can I show just one font when pasting (the font and format from the Word document seem to change when pasted into a Rich Text field– except for colors)? The font preference is Calibri 11. 3. How can I “couple” or combine 2 similar Award Names into one award name? Award name is an object in the app. The example is where one award name such as “Harris Poll” and the other award name is “The Harris Poll” need to be combined into one new Award Name, “The Harris Poll” such that the children from both parents go into the new “The Harris Poll” award name parent. 4. How can I search for a word such as “valuable” in the award detail field (an element within an object)? 5. How can I create a calendar in Salesforce? I already have the Calendar Report, I just need to be able to see It in calendar form. attaching links for my documents to show you what exactly do I mean. please copy paste the following links in ur address bar you can see them…. Thanks for the awesome study guide. I passed the exam today with 100% in 10 sections and 80+% in the others as well. Your guide helped me a lot. Awesome work, congrats! And thanks for sharing! Thanks John for the great source. I used your source for my whole study. I passed the exam today and it was NOOT easy ! Thanks again. Awesome! Thanks for sharing, great work! Hello John, Can you please reply to some of my questions in the ‘Nailing the Gotcha questions’ section? I am seriously preparing for the certification and your answers would help me a lot. Your website was one of the key reasons I passed my Adm 201 exam last week. Thank you for this initiative and all the help you provided in understanding the questions. Your website is no doubt a great resource for all the consolidated knowledge one may need to understand and pass the exam. Does anyone took App Builder exam and passed? If so, please suggest any website and other information. Thanks in advance. Awesome, thanks for sharing and congrats! Thanks for the excellent study material. I passed the Admin exam. Congrats vasanthi , Could u share any of the questions in ur memory ? Congrats.. I am planning to give exam in 2 days. Do u mind sharing some question from ur memory. Also were there any questions from the SP17 release notes or any lightening experience questions ? there was one question regarding the lightening synch https://help.salesforce.com/articleView?id=productivity_sync_exchange_overview.htm&type=0 how does it sync. There were not major questions about lightening as such. I’m planning to attempt for the ADM 201 in the coming week can you please forward the material ? Just a small note to say a BIG THANK YOU for sharing the study material. I was clueless when I first signed up. Your site really helped me immensely. I passed the Admin exam today. Awesome thanks for sharing and congrats! Just signed up on this site. Specific place where i can get the guide- not the Salesforce guide but the one from Cert on demand. I have registered myself for the ADMIN 201 and wanted your guidance on the prep for it. Not only is this a terrific certification test prep site, it’s also my favorite “refresher” resource as I have questions. So, join for the training and know that it’ll be an excellent reference as you need to learn more in the future! Hello John, I successfully passed exam last week. Thank you for your help. Well structured material made it easy to prepare! It would be great if you have study guides for other than admin exams. Hi John, I passed my certification exam last Tuesday!!! Your site made it possible. Trail Head was great for getting the Salesforce “way” of thinking and flashcard type sites for sheer memorization, however, your site is the most robust with an excellent mix of subject matter. Your site made it possible for me to use the other avenues for learning and not give up. Thank you for making this so available to all of us. Again, thank you!!! Hi John – I got my Salesforce Admin cert this wk, thanks for putting together this site – it really helped me a lot. I did the Salesforce Admin trail on trailhead first, and then used your site to dig deeper and prepare more thoroughly. Besides that, did a lot of practice questions. I got 73 questions too with 110 minutes as some ppl have been commenting – salesforce adds unscored questions on some exams to test out new questions i guess, this is common enough on standardized tests. Got a few questions on Communities and some on lightning. If you put together guides for any other salesforce certs, i’ll be sure to try them out if i’m going for those in the future. Thanks again. I also used the chicagosfdc and bulkified sites John recommends towards the end of this guide for practice questions. Study from this guide, try out things in your salesforce org, and do the practice questions, and you should be set (the 30 question practice exam John has was the same difficulty level as the actual exam in my experience). Thanks for the great feedback and congrats on passing the exam! You have an excellent resource here. A true gem. I recently passed the Cert exam. A few thoughts on the process. While I recognized many of the questions some are reworded just enough to make sure you have to know the material. The CoD trainings truly meant to be taken in its entirety. Study each section completely. Use Trailhead and study SFDC best practices. This exam is not kind to the self taught, especially if you learn via trial and error. Leave your ego at the door before you go begin studying. This is go long way to letting you learn the material. Did I mention, use Trailhead as complementary resource. Thanks again John for such a great resource. Thanks so much for sharing, and for the recommendation. I’ll be looking to add more in the Trailhead department moving forward. Also- congrats!! I passed my certification test on Saturday. Thanks for putting this very informative documentation. Awesome work – thanks for sharing! And congrats! I passed my Admin Certification a few days ago. Thank you very much for maintaining this site, a great resource for anyone trying to get certified! Awesome thanks Yogesh for sharing – and congrats! Successfully passed the exam today. Thank you for a great resource – very comprehensive and up-to-date. I think you can improve the navigation a bit – perhaps a tree structure that always remains on the left so the users clearly know where they are at any time? Also may be you can double the number of questions on the practice test to 60 so we get a full test experience. Before starting on this guide, I worked through all the chapters in the Force.Com Platform Fundamentals (https://resources.docs.salesforce.com/sfdc/pdf/salesforce_creating_on_demand_apps.pdf). General exposure to or experience in sale and customer service business processes helps understanding the Sales Cloud / Service Cloud topics. Any exposure to data modelling / database design and application security concepts (e.g. in other applications like SAP) is a bonus.. I also found there could be information overload initially, so spreading the learning over a few weeks is better than cramming into few days. And finally more hands on experience (on the job or otherwise) the better. Awesome congrats Wayne, and thanks for sharing! Thanks for the great content. I just passed my certification exam on the first try w/ no previous salesforce knowledge or experience! I will highly recommend this guide to anyone in search of a fast track to certification! Great work, congrats on passing! I passed the exam today on my first try thanks to your course! I wanted to thank you for creating this site and for always replying to my questions so quickly. I also wanted to share with your students that I studied for this exam during my maternity leave (we get 3 months where I am located) and even tried to study 20 minutes a day since I had a newborn – if you have a goal to pass this test this course will help you! can you confirm that Salesforce Certified Administrator (SP17) is same ADM201 certification or different one? That’s an awesome goal to achieve with a newborn, nicely done 🙂 And thanks for sharing! is Salesforce Certified Administrator (SP17) nothing but ADM201 certification or different one? Timing is increased to 110 minutes for salesforce ADM 201…?? I could not find any documentation anywhere. However in my exam reminder it says time allotted is 110 minutes. Anyone have any idea..? I have exam coming on 31st, I got reminder today says that time limit is 110 mins. and when i registered it was winter version and now it changed to spring 17. But nowhere in website or study guide they have mentioned it. I took the exam today. There were 73 questions and 110 minutes. On the salesforce website, there is a disclaimer that they often add in un-scored questions to evaluate question performance. 60 of the questions are graded, the others are not. Passed mine today, it had 110 minutes down but mine was only 60 questions/90 minutes. It did have the same disclaimer about additional questions but I never had any. I wanted to say thank you for your excellent study guide. It was well worth the money I spent. I passed the admin exam on 3/20. This time, I studied only your guide before I took my retake. I felt over prepared, but in a good way. I believe the retake may have actually been the same test I took the first time around. I could recall some of the questions from before. I didn’t get asked one Lightning or release related question. Thanks again! I hope you develop more Salesforce certification study guides in the future. Thanks so much for sharing and congrats on passing the exam! I want you to thank you and have you know I passed my Admin certification on March 6, first time I tried it. Your study guide was the biggest reason I was prepared for the test well. In addition, the Who Sees What Series was extremely helpful. A few tangents from your website, but the bulk of my studying was your material and your exams. I have to tell you I failed your practice exam at the very end of your study guide first time I took it, but somehow I passed the real exam first time I took it. That is a mystery. Thank you for putting this study guide together at a reasonable price and allowing us to login continually regardless of when we purchased. I purchased your guide more than a year prior to actually studying in a focused fashion. You have made a significant difference in my life by providing an effective path to a desired goal of Admin certification and fine tuning your material as needed. I am studying for another exam already. That is such amazing feedback, thanks so much for sharing 🙂 … and congrats on your pass!! So I took my exam Mar. 13th and didn’t pass but felt like I was really close to passing based on the percentage breakdown that Salesforce sends you after the exam. I heard that when you retake the exam a lot of questions are similar if not the same for your retake. Is this true? Sorry to hear that 🙁 Most important- do you know which questions you likely missed? I don’t know from personal experience but I have heard that as well… all that said, I wouldn’t bank on it. Honestly I was so nervous I could barely remember any of the question after I took the test which I was wonder if they were going to be the same or similar when I take it again tomorrow. I would hate to get the same questions wrong if I thought I was right an select the same answer. Both tests are the WI17. I took the exam twice last year and failed both times. The questions the second time around were different than the first time (I thought they seemed easier)as they are randomly generated each time you retake the test. This was last year and they didn’t provide any percentages after the test; only pass or fail. So I can’t wait to try this year and see how well I do now that they are providing the percentages! Was your second test taken in the same season as the first? Hey Jeanne – I’ve talked to several people in this boat and it can be very difficult to figure out exactly where you’ve gone wrong if you’re not getting any exam feedback. Additional questions are on the horizon for this site – if there’s anything else that would be helpful to add please let me know. Can you please explain below? ◦After enabling custom fiscal years, when you define the first custom fiscal year, all existing forecasts, forecast history, and forecast adjustments from the first period of that year forward will be deleted. Forecasts for periods before the first custom fiscal year are not deleted and can be accessed as usual. ◦Subsequently, when you define a new custom fiscal year, any existing forecasts, forecast history, forecast adjustments, and quotas for the corresponding standard fiscal year are lost. Lets say I am using standard fiscal year, but moving to custom fiscal year from 7/1/2017. 1. when you define the first custom fiscal year, all existing forecasts, forecast history, and forecast adjustments from the first period of that year forward will be deleted – So my standard fiscal year reports prior to 4/1/2017 will be deleted 4/1 and moving forward? 2. Subsequently, when you define a new custom fiscal year, any existing forecasts, forecast history, forecast adjustments, and quotas for the corresponding standard fiscal year are lost – I believe this is same as number 1. Fiscal year reports should still work – its the forecasting data itself that would be impacted (based on reading the above). I suspect this means that forecast data from the first quarter starting 7/1/17 would be lost – I would suggest trying this out in a developer environment or sandbox to verify. 1. I am planning to take test in next two months. Do I have to read Spring 17 release notes? Hi John, Thanks for your course! I passed the Administrator Certification exam today. Do you plan to add similar courses for Sales Cloud/Services Cloud? If not, can you point me in the right direction? I passed the admin201 today on my first try! This site has great content! I want to say thanks John! I have passed my ADM 201 certification exam today and I am very thankful, this site and all resources related are the best way to get certified. Thank you very much John, I passed the exam on Friday. Your course is THE ONE that helped. Passed my Administrator certification today. Wanted to say thank you for the great study material! I encountered the same issue today, delete your cookies and refresh. This fixed it for me. This will happen when you click login and you’re already logged in – I’m working on fixing some of the navigational issues with the site and this is one of the things that will get addressed. Thanks for the feedback! I’ve recently completed 201 certification. I’ve mostly studied on your site only and your site was very helpful to pass the exam. Now, I’m looking forward for app builder certification. Would you please let me know what’s best way to get started with app builder certification? Any help on this would be highly appreciated. Please revert back me on gmail on maulikurl@gmail.com. Thanks for all your help in advance. I just passed my Admin 201 cert on the first try. While I did use some sites and flashcards, the bulk of my studying was done with your site. Thank you! I’ve been recommending this site to my non certified colleagues! Thank you John for all of your work on this site – and especially for the excellent coaching you provide in the Comments on every web page. I’ve been a Salesforce user for years, but your thoughtful exercises and explanations prepared me to pass the exam – after investing the 100 hours you predicted! And my exam score was exactly the same score you predicted based on my answers to your final, Practice Exam. Best wishes if you are starting to prepare for the exam – rather than waste any time – just follow John’s program. His “musts” are vital. Just passed the Salesforce admin 201 exam. Preparing myself for 401. Any help/tricks/tips to pass 401 exam would be greatly appreciated. Hi – I just signed up based on a recommendation from a colleague. I will dive into the guide but I am trying to find a place which lists the overall for each area? Does that exist? Thank you!!! Just passed my certification exam yesterday, thanks for the great resource John. I honestly got way more out of $40 for this than I got out of the much more expensive preparation course. I saw you mention in another comment that you were evaluating doing this for other certs. I have to do the dev one now, and I would definitely pay again for access to a similar resource for that. I know it wouldn’t likely be up in time for me to use it, but i’m sure others would feel the same way. I have failed the exam . Now, I am preparing for my next attempt. I would like inputs from you to pass the test. What did the Salesforce exam report tell you on a topic by topic basis (percentages)? How long did you take to prepare for the exam? How did you approach/study? Where did you feel that your knowledge was weak? Any other insight you can provide might help us steer you in the right direction. As recommended by my CRT-101 instructor (even though I had signed up) I used your guide and practice exam to study for my certification and passed! Your test is a great tool to test your knowledge level and harder than some of the other practice exams on the market (still not as tough as the actual exam…that is an entire different level!). Thanks again for making such a great resource! Awesome work – congrats!! From everything I’ve learned the exam has increased in difficulty substantially in the last few releases- I’m looking at putting out some more challenging questions in the future. Thank you John for putting out this guide ! I cleared my Admin exam today and this guide was the only reason I could do it !! Thank you John for this website which helped a lot to guide me which area I need to focus on the exam. I have prepared very well and passed it. Hi John- Thanks to your website I also passed the exam first time on Wednesday! Will recommend to others. Awesome, thanks for sharing… and congrats! passed the exam. thanks john! – trailhead was useful for revision after i had covered the topics with youtube videos/workbooks/other material. All very great tips- thanks for sharing… and congrats! Hi- what was your ballpark total hours of study from start of this course until taking the exam? Just wondering as I just signed up for the paid version. Passed my admin certification yesterday in my first attempt. The materials were very much organized. Thanks a lot for putting it together. congrats . this is my first time and i am going to write my test in the first week of jan. I want to know about the questions. Are they similar to the questions that are on the certifiedondemand website. i saw some websites but some questions are too difficult so i want to know the difficulty level of the exam. Thanks for having a very thorough site and study guide. With the info learned here and the practice quizzes etc. elsewhere, I was prepared enough and passed the certification exam on the first try. Awesome thanks for sharing Ken- and congrats! I’d like to thank you for putting together such a wonderful material to study for Admin 201. I am a newbie to Salesforce and so finding all the topics under a single roof was extremely hard and overwhelming for me. After going through 2-3 Udemy courses and an attempt at the examination, I found your course and man I was impressed with it. I loved your attention to detail in every aspect of the course. I took my time to study through everything and my understanding of the subject is a lot better than what it used to be. I now have the correct understanding of the topics and how they are linked with one another. I gave my exam today and I am delighted to share with you that I have cleared it and I want to thank you for your material. I promised myself to come back to your site again to practice all the exercises thoroughly before I get into a job. The material, the exercises, the quiz and the discussion in the comments section were of great help. I want to thank you once again for taking the effort to put together a lovely up to date material. I also passed my exam a couple of weeks ago and owe a lot of my success to this website! It is sometimes challenging to find accurate and up-to-date info about Salesforce and I found this to be one of the most reliable and consistent sources. I tried two udemy courses, one of which had brain dumps with INCORRECT answers. They say once you learn something it takes twice as long to undo and relearn the right way — that was very frustrating, but I am so grateful to have found this site to correct my wrong teachings! I also appreciate that questions were answered very quickly. I would definitely recommend this website (and already have). The $$ is well worth the certification. One note: I am not a great test-taker in general, so it was also useful to take the practice exam at the end of this course and to find some other practice exams online to get used to exam-taking. I also think it’s important to take an exam for practice, if you can afford it. I took my first one as “pass/practice” to take the pressure off when getting an understanding of what the exam is like. Awesome to hear this- congrats on your pass! And thanks so much for sharing! I purchased the material from Justcerts.com. Many answers are wrong and the setup does not work. It seemed like they would give material but its just questions with answers of which 20% answers are incorrect answers. Took my admin test today and passed! I owe much of my success to the website you’ve put together, I think i’m safe in saying that I couldn’t have done this with any other resource. Thanks for putting this website together, and I hope you release other Salesforce exam prep in the future! Brilliant- congrats Rahul and thanks for sharing! I loved this course and passed my 201 admin exam last month! I work as an implementation consultant for a Sales Acceleration company and work with Inside Sales customers who use our tool on Salesforce. I think my next cert I want to gain is the Sales Cloud. Do you recommend to review this course again in preparation for that cert, or are there other things I should look into besides Trail head? I don’t have a list of resources for other certs- but you will definitely need to look into other materials. Maybe something I will put together in the future. Congrats! Hi John, Thank you for this site! I passed my Salesforce admin test and because of my new certification was able to get a new job, after a layoff from a company acquisition. Some of the best test advice I read, was to carefully review everything on your site just before going to take the test. I have been an admin for a few years, but there were so many gaps, I didn’t know what I didn’t know and your site taught me so much. Thank you! That’s awesome! Congrats on the pass and the new gig. Awesome how a certification can open doors. Thanks for sharing. Passed my Admin certification yesterday and this site really has a great share in this. As you mention, the true challenge is to handle all this surplus of information and figure out what is needed for this exam and what is not. The fact that you, John, did a very good job at dividing the SF topics into smaller topics helped me a lot. Very grateful for this website! When doing some practice exams I realized that some of the topics here lack a bit of detail/depth but then I guess this is also not meant to be a stand-alone guide. Thanks a lot for your effort! Thanks so much for sharing- and congrats! Do you have a study guide for ADM 211? I’m working with salesforce since last 6 years – I know administrator portion as well as some coding – preparing myself for admin 201 exam. I have heard lot about this site. Can someone please explain me how this site would be handy to pass 201 exam. Also, what will be the actual duration to complete the on this site so can take the exam date. Any help on this would be highly appreciated. Hi there- with 6 years of experience you will have a leg up on most folks preparing for certification. This site will help you quickly identify the areas that you do not use often but are still crucial for the exam. The FAQ has some metrics on timing as well- good luck on the exam! Hi there- if you are referring to an exercise, can you post this comment on the specific page? Thanks! Thank you for taking the time to put this resource together. I passed the Salesforce Certified Administrator Exam first time yesterday. This guide was by far the best value and most cohesive guide I found to study for the exam. A word of warning to those sitting the exam for the first time – you do need to have a very good background working knowledge of salesforce. A lot of the exam questions were tricky and covered themes beyond the scope of the Must and Should resources here. I had to draw heavily on my 2 years user experience of salesforce, as well as what I learned here so worth considering before booking an exam. Awesome- congrats Simon, and thanks for sharing. Do you recall any specific topics that were tricky or could use additional emphasis? Can I first and foremost re-iterate that this is by far the best resource I found to revise from. I felt exceptionally well prepared for most of the topics. The advice in the “getting certified” section was great, in particular the article about how to approach answering an exam question with examples of the thought process – that helped me through the questions I felt fell outside the scope of what I had studied as I was almost always able to eliminate at least one or two options. Questions I found tricky fell mostly in the following areas: User Interface, Formulas, Content vs Knowledge and Chatter. I felt there were some questions that were a bit outside the scope of what I had studied. In fairness, there is additional information in the “could” sections that I did not have time to read as I had set myself a short timeframe to self-study. The other thing that caught me out is the level of detail in the questions, which are possibly more detailed than those in the practice exams here. I wanted to post to make sure that people have as much info as possible before deciding to register for the exam. Thanks Simon – really appreciate the feedback. I’ll be looking to beef up content in those areas. Additional and harder exam questions are planned. Yesterday I passed ADM 201 yesterday, Thanks for putting all together and quick reply’s for questions asked by members. I am planing to write Platform Developer-1, could you please guide any material/links. Thanks once again. As like a lot of people on here, I’ve just passed my 201 exam and this site was invaluable in both structuring my study and the study itself. I would definitely recommend to anyone looking to get their Admin Cert! Just wanted to thank you for all the work you have put in the site. I just passed Certified Admin exam on my first attempt and could not have done it without your help. I have cleared salesforce admin certification last monday, thanks john. Please suggest good salesforce development tutorial. Would appreciate an immediate and. which of the following statements is NOT true? Please select two (2) items. I’m a little confused by this response. How can the standard & custom object both be the master? Sorry I misread that; you are correct D is false. But C,A, and E are all true, and it says to select 2. This question isn’t written correctly. hi john i thought this was b & d – isn’t b also false? I passed the certified admin exam last Tue, 25/10 NZT. I definitely must give your site all the credits to help me get there! Thank You for creating this amazing training material! It was the best investment I’ve done! Best Salesforce training material ever! I’m from NZ and find a reference to your blog on youtube. Sorry, don’t recall which video, as I watched a few dozens! It’s absolutely true what you say in the introduction of your site: “Processing the abundance of information is time-consuming, and it is often difficult to understand what’s truly important to know when preparing for a certification exam”. In the beginning, I was lost. Then, darkness became light after I found your site! 😉 Once again Thank You! Is it possible, to view all the videos in one place for a quick review? Hi, i have no previous exposure to Salesforce but i have to pass SU16 admin certification, the basic one to get a job. I have just 3 weeks time..can it be done.? I bought the paid version i am spending 8 hrs a day. I have IT masters degree, but that was 4 years ago. Also doing Trailhead..its tempting to look at dumps..but i heard they r mostly outdated. Hi John – I loved the study guide for the Admin exam and recently passed my certification test. Do you happen to have one available for the App Developer certification? Called on number [number redacted] which was shown in email for any help and person on other side (which i believe is john because voice mail says so) picked call. After listening “is it certified on demand” he dropped the call. What kind of professionalism is this? If you can not cater to queries please stop charging money from users. Else be there to answer queries. My sincere apologies for any inconvenience – the number you called should not be associated with the website. That was my personal cell phone, which rang at 11pm on a Saturday night (I wasn’t in a position to quickly explain this over the phone). I have since replied to your email, and will schedule a follow up call with you as needed. Can you just suggest a best practice to study the guide because I ma confused while I am trying to prepare? A quick note and feedback to advise I passed the ADM201 exam. I’ll be honest and admit I did A LOT of digging around the Web for material and found quite a few resource. However, I must truly confess that your material was BY FAR the most structured I found. THIS, I believe was the key thing that put it all in harmony and made it all make sense. So thank you and I’ll be soon going for the Adv. Admin. Hi John, just to let you know I passed my certification exam last 3 Oct 2016 in San Francisco (Dreamforce ’16). Thank you for all the useful information provided on this website. Hey John, I passed my admin 201 exam at Dreamforce today. This guide was invaluable, thanks! I passed my exam today at Dreamforce too! I couldn’t have done it without this guide! Thanks John. I took and passed the Admin 201 Exam today after using your website as my primary studying tool. Thanks for great content and for your diligence keeping it updating, could not have done it without your materials! That’s awesome thanks for sharing the feedback- and congrats!! I was trying to do a career change and I was recommended by one of my friends to use this site. I can say that this site has been of immense help. I also went through Trailhead and would strongly recommend anyone who is planning for the certification. You have organized the site pretty well and it gave me the confidence to get through the certification. Hi John, I passed my ADM 201 today and I am glad I subscribe your paid account cause not only it has helped me pass the exam but also help understand many aspect of administration I was not aware of. Thanks you for this great resource. Thank you for your reply, I was wondering to check how many days did you prepare for the admin 201 exam. Could you please also let me know if the paid version is enough for preparation. Thanks for the post Ajay – and congrats on passing! I thought I could pass the Salesforce Administrator Exam only using Trailhead. But I’m positive if I hadn’t used your site, John, I wouldn’t have passed the exam today. Thanks, John! Awesome- congrats!! and thanks for posting! Could you please let me know if the free trial version is enough for ADMIN 201 certification and I was wondering to know how we can find the difference between the production environment and the developer environment? Hi Svi- the free version is not designed for preparation for the exam; it is designed to give you a feel for the format of the guide. SVI, I had thought the same thing when I first found this site. I failed my first attempt at the test using only free Certified On Demand & Trailhead. On the second time around, I spent the money for the membership and helped tremendously, passing the test. Granted, everyone learns differently, but the paid version of this site was my missing piece. Good luck! Thanks for compiling the content here. I used your site to prepare for my second pass at the exam and it was immensely useful. I took the exam 6 days after my first attempt and passed. I feel the differentiator was the content organization. Sure Salesforce.com has Trailheads and there is tons of content online. But your site distills it down to the bare necessities for ADM201 but at the same time helped me firm up the core concepts. So it is not a short cut to get the cert. Rather prepare to meet the exam requirements in a expeditious manner. Great job! I think you will see a lot of people line up for your advanced cert compilation. Awesome feedback thanks Rajeev- and congrats on passing! Hi John, I am wondering to check if the free trial version is enough for ADMIN 201 exam ? One more question is how do we check which version of environment we have, I mean the production or developer(DE), or any other because I have a org Id but I am not sure which one it is , I created it through the link given to me by my trainer. Please see the FAQ – the free version is intended to give you a feel for the format, not prep for the exam. 1. How latest is this : 2016 – which season? 2. Once purchased, do I get any updated copy or deltas – as per Salesforce upgrades/releases ? 3. Is it only for the guide or any additional benefits/accesses provided? 3- This is just an admin prep guide for now! Are there any coupon codes to sign up ? I am planing to write exam by end of Sep2016, i am wondering if there will be questions on Lightning. is Lightning in scope for exam? You might not want to skip it but i dont think you should be worried on Lightning particularly for the exam. First of all there is hardly any mention of it on the study guide and second User Interface is just 1% and you might or might not get a question on that. I did not get any. I would suggest you to pay more attention to areas with higher weightage and where more understanding is required. Thanks for clarification, it make sense. I cleared the exam last week and wouldn’t have made it without COD. This is a great resource and i’m sure this will serve as a good reference for anyone looking for help on core topics. NOTE: For those who are looking for one guide that will help clear the exam and if you are reading my comment now, look no further, you have come to the right place. Read each and every topic mentioned here especially the Must & Should and take the quiz at the end of every topic very seriously the exam questions are similar. Build your fundas strong here and don’t forget to take the mock exams on other sites too..
That’s awesome thanks for sharing- and congrats! I signed up, but whenever i click Login – it doesn’t take me to a login screen it brings me back to this page to sign up again. Where is the direct link to actually login? If you are registered for a free account and trying to access paid content then it will take you back to the sign up page to buy access to the guide. I just took the Salesforce Admin Cert test. They were asking a lot of questions about communities. Interesting…and Thanks! I guess this just proves that we really need to know as much as possible! There were about 5 community questions. It is possible I took the wrong test. I took the Salesforce Certified Administrator (SU16). That’s the right one. Thanks for the heads up- I’ll look at adding some content. You might have gotten a skewed block of questions from the bank, that’s not in alignment with the study guide %s. Can you tell me – if I purchase this program, will I see more questions than what I see in the free version? I know a purchase will “open” the quiz for each section that is closed to the free version, but how large is the bank of questions for each section? Since I’ve gone through all the free ones, will there be additional questions for those sections if I purchase the program? Thank you for any clarification. Can you please give me a step by step look over what is SDLC process in Application developments and deployment . Thank you for setting this guide up. It has been my main study guide and it was really helpful. I did my Admin exam today and I passed it. Thank you!! That is awesome news, congrats and thanks for sharing! I passed my Admin exam with the help of your guide. Thank you!!! I passed my Admin exam today, and wanted to say thank you for putting together this guide! Without it I don’t think I could have achieved success in the time I did. Would love to see one for Developer! Congrats on clearing your exam !! I am going to give it next week. I am a bit nervous. Can you share how easy or difficult are the questions (in comparison to the practice test on COD)? Hi, we need to register for “Salesforce Certified Administrator (SU16)” exam right? or there is another exam “Salesforce ADM201”? I passed my exam today. John, thank you a lot. Your material was extremely helpful!!! I passed my this Monday , Just wanted to thank you John. Do you have advices to pass the maintenance exam ? Thanks for putting this together John! Just passed my exam today. John just wanted to say thanks for all your hard work to keep the site up. I just passed my Salesforce Admin Certification today. The secret to my success was using the following tests online with your training. determining how much I knew about it to be the key to my success. Awesome thanks for the recommendation Fred and congrats!! What does this offer that trailhead doesn’t? One thing that is really missing there is flashcards. I’m sorry, but I’m not seeing anything here that I don’t know is already there … but if you had flashcards to prepare for each of your quizzes I’d part with my $40 in a second. In less than a second. Dave, I took my admin test the first time based strictly on Trailhead knowledge and failed. I signed up for this site, paid the $40 (and used bulkified.com as well) and passed. Trailhead is nice about telling you about the tools but this site is better at helping you apply the knowledge, which is what the test is all about. I passed the exam last week. Absolutely recommendable site for anyone wanting to take on the challenge. Thanks John for an amazing source for Admin exam, today I passed my Admin Certification without any prior knowledge on salesforce . I highly recommend your tutorial. That’s so awesome thanks for sharing, and congrats!! I am trying to understand , Is that “Salesforce Certified Administrator (SP16)” & Salesforce ADM 201 are same? , I have recently appeared for Salesforce Certified Administrator (SP16) but found that its bit more complicated than i thought? I am not able to make the Payment.The Payment page does not appear.Please resolve the same. Thank you, John! CertifiedOnDemand laid a great foundation for me for the Admin Certification (which I got!). This is a great resource and I recommend it to anyone planning to take the Admin exam! I do want to know what is Software development life cycle really mean in words in Salesforce..
Is that need SDK kit knowledge or other supporting application developmental tools or what we normally do for application develop and deployment steps? That’s a big question – I would look at developer.force.com to get started. Now a days going with some interview possible queries and came across like some industrious the SFDC admin are supporting more then 300 users..
Can you please make me understand how exactly they count all those users..is that only technical user in SFDC org or non technical also? Like Opp. owners count as users or stakeholders and Developers with SFDC org. Admin or delegated admin with SFDC org. managers and other role who use SFDC..so i just believe it include sales and service side users too,right..who ever have login access to the org? am i correct or if not please make me understand..
Just letting you know I passed the ADM201 exam today! Your site was extremely helpful. My method to prepare was doing the admin Trailheads (beginner through advanced), then going through your course, the running through the quizzes on http://www.sfdcstudy.org/ — I completed the exam in 44min including review. Awesome well done! Thanks for sharing, and congrats! I passed the admin exam today without any previous salesforce experience. Thanks to u for making such a wonderful site. Let me add another humble note to an already stellar list of comments. This is by far the most cost-effective and comprehensive self-study program that I found. I was on a very limited budget and the small fee I paid , literally paid off. I took the exam yesterday and passed on the first try. My advice to all who are studying for the Certified Admin exam is to go through ALL of the material John has collected and presented, do ALL of the exercises diligently, take and retake the mock quiz as many times as it takes to get to 100%. In addition to that, take other quizzes that are out there, but VERIFY EVERYTHING. It will take a long time, but sometimes the answers are wrong. How will you know? Only if you really study the material and believe me, it pays off in the end. It took me more than a day to go through the entire 175 questions of this mock quiz: http://www.sfdcstudy.org/adm-201-certification/adm-201-quizzes, but it built up a ton of confidence. I referred to John’s study guide a lot and researched and tried out solutions on top of that. As a result, I completed the actual test in 45 minutes and then spent an additional 13 minutes on review. In 58 minutes I was completely done and I passed! It’s a great feeling. Now onto the next level! Thank you John! Thanks for sharing – and great tips! Especially love the advice to verify all of the practice exam questions you find on the net. You’ll learn the material really well and you won’t get tricked by thinking an answer is right when it really isn’t. Congrats!! John, I passed the cert exam on the first try today! Thank you for creating this incredible study resource. Your guide is like ‘The Elements of Style’ for Salesforce. You have a gift at brevity and clarity in presenting a massive amount of technical material. Congratulations! How long ago did you start using this site? How often did you study and for how long? Any study tips? I have a couple of questions about taking the exam as I have concerns. I am in a Salesforce Admin/Developer role at work and have about 18 months experience of using the platform, so I am familiar with much of the functionality. I have been using your study guide for the past 3 months and have just completed it, I have taken detailed notes along the way. I feel I have understood all the concepts and have done well in the practise questions. However, looking at my notes I have made loads and loads. I have started looking at them from the start again and I have realised there is so much material covered, there are parts that I have forgotten already as I covered them a couple of months back. 1. Will the exam just cover a basic knowledge of each concept? How much detail does the exam go into? 2. Are your practise questions on your site of a similar difficulty to what is on the exam? 3. Your study guide goes into much more detail than the simple Salesforce study guide. Will lots of the little things appear on the exam or will most questions just cover the main topics their study guide covers? I have spent 3 months and many hours studying yet I am still not sure if I am ready yet? Although part of me wonders if I am going over the top attempting to know every detail possible when I only need to understand the basic concepts? Thanks for the effort in doing the site it has been really useful in learning. It is hard to say if you’re over-preparing or not, although I suspect you may have done adequate prep. If you did well on the practice exam then that’s a very good indication. I’m happy to report that I passed the Admin exam this morning. Many thanks for putting together the website, it was a massive help in preparing me for the exam. I have been studying since the start of February and must have put about 150 to 200 hours in so it has been a lot of hard work, but well worth it. 1. Do you not get a percentage score for the exam? I have only been told I passed but no score? 2. Having looked at the Advanced Admin study guide it looks like it concentrates on particular subjects rather than a wide spread of knowledge like 201, would that be a fair assessment? 3. Any advice on sites that would be of help with the Advanced Admin or Developer exams? Thanks for the feedback and congrats! I took the exam today and halfway thru, I realized that I was doomed. Too many questions that were slightly mentioned on the official SF study guide or not mentioned at all. I was getting high marks on “other sites” and had the feeling that I should expect similar questions. I checked with another person that took the test 10 days ago and she mentioned that her test was quite different than mine. Now that I took a good look on the content here, I am pretty sure that this site is the real deal. Back to stage one, this time more humble. I’m hearing more and more that exam difficulty has increased. I believe the questions come from a larger pool of questions- so you may have gotten a more challenging set of questions than someone else that took the exam. But yes the exam is designed to be challenging and you really do need to know how the system works in a practical sense in order to pass (spend time configuring…!). Good luck on your next attempt! Hi John, thanks a lot!! I passed my Salesforce administrator certification exam!!! The study material, links, quiz and scenarios helped in preparing for the exam. And since the layout is according to the format of the study guide, I found it easy to go through the content. Thanks again!!! Just to report back that I passed the Adm201 cert this morning. John thanks for putting everything together on this website. Without this place, my study would have been ineffective. One other resource that was very helpful was focusonforce.com. Best of luck to everyone else. I passed the Salesforce Admin Certification exam today thanks to the contents of this site. Thank you!!! Just want to learn wave analytics, as it’s a new topic. can you please guide me where can i find the detail notes and some good use cases. you.I am in the process of preparing for App builder certification and am little bit confused when it comes to USER INTERFACE topic mentioned in study guide. Apart from lightning app builder ,custom buttons and links whether i have to go through lightning experience,lightning components ,visualforce and apex too. So what topics should i go through under USER INTERFACE mentioned in study guide. WAITING FOR YOUR REPLY JOHN . Can anybody who is APP BUILDER CERTIFIED guide me for the above mentioned. I did the app builder migration exam a while back. Definitely study lightning. There are additional questions on the data model as well as order of operations (e.g. which comes first validation rule or workflow rule). I successfully passed my admin exam after 3 weeks of study from this site. Thank you very much! Used this site to help me pass admin 201!! now i want my sales cloud certification, does this site help prepare for that as well? if not what do you recommend? I’ve already begin preparing to self study for this exam but there are far fewer resources than admin 201.
let me know if you get any feedback and ill keep you updated as well. Hey folks- replied to a comment in another section. This guide is not aimed at Sales Cloud certification- it will certainly help but is not inclusive. I don’t know of any additional resources other than the staples (Trailhead, online or in-person training, etc.). Good luck! I’ve one question please: do you recommand a good way/website to prepar the sales cloud certification ? Hey congrats Arty! No specific advice on the user interface other than to review the Lightning Experience. Thank you for putting this guide together! I passed the exam today and your site was the reason why. I would recommend this site to anyone looking to learn more or to prepare for the exam. This might sound like a silly question. If I study just the “Must” part leaving out the “Should” part and the “Could” part, is it enough to pass the admin certification? Thank you. Please see the FAQ- it all depends! I passed the admin exam today. This site was essential to my success. That being said… talk about minutia! Thanks for all the valuable info on this site!!! today I passed the SF Certified Admin Exam and your site was of a great help in preparing. Especially in helping me structure the learning process. Thank you for doing and updating this site. I just passed my Salesforce Administrator Exam, using only this study guide and my experience as an administrator. Thanks for putting this together. I learned a lot while studying and was able to apply the knowledge to my organization. I wish you had this for the Dev 401 exam. That’s awesome, congrats! Thanks for sharing! Quick feedback: I am about 35% through the material here and I have completed 21 Trailhead badges so far. I just checked a Quizlet flashcard with about 80 questions. I could confidently answer 90% of the questions related to the areas I studied on CoD, and I was able to identify weak areas. The most interesting thing was that I could confidently identify the wrong answers on the cards due to change in SFDC functionality. The cards are based on Winter14. I really don’t think Trailhead helped much other than introducing the basics. CoD has really helped with understanding the material, so if you are on the fence about paying for full access – jump over that fence and pony up the cash. Its worth every penny so far. I’ll leave another feedback once I take and pass the exam! Can you suggest me any Frequently asked Questions for interview purpose (For Salesforce BA position). and also i want little knowledge on SOQL and SSOL to use Developer Console . Can you please provide me some source to learn these. hard to say for sure but I would fear the materials might be outdated or inaccurate. Not to say you can’t use them but I would fact check as you go (which is a good exercise regardless). There should be sample data in a new DEV org – click go after selecting the “all” view – e.g. All accounts. By default only shows recently selected records. I recently bought the access to your site. What I want to know is there any pdf version of the site’s content or do I just need to browse page by page? Correct – there is no Pdf export, all pages viewable online. Would like to thank you for your amazing effort to answer everyone’s questions. Also putting together this guide! I am so happy to announce that I just came back from passing the ADM201 certification! Your site helped me so much in the preparation. I have access to the partner portal training but didn’t use it as much because there is too much information. Your site was great in consolidating the study material. I would highly recommend all who might be taking the exam soon to do the excersizes. The test is designed to test if you really know how to administer. Run different types of reports, create dashboards, play with the profiles, tinker with the service cloud objects such as content…I overlooked these since it was a small part of the exam but the test has enough questions from these small sections to cause you to fail if you don’t know the content. Also, it will make you a better admin practically if you do have overall knowledge besides just passing an exam. I currently work for a company who uses Salesforce. I am so excited to contribute to my knowledge to my team and the company. John, I am not sure you realize your impact on people’s lives through this guide. A genuine heart felt thank you to you. If you were here right now, I would definitely give you a hug and invite you over for dinner at the house! Seriously, is there a way to donate to your site? If so I will definitely do so in hope that you keep up your effort and perhaps create more guides for other exams like DEV401, DEV501. Thank You John…you are the man! I agree this site is the best guide out there for the admin cert. I am starting to study for my advanced now and after using this site I am using this format as a template to gather my reaearch. Wow… thanks so much for sharing. Comments like this keep me motivated to keep this site alive and thriving! I will definitely keep everyone posted if I decide to release another study guide. And congrats on your certification! Totally agree with @afarooqui . Your site is amazing and thorough! I cant even imagine how much work you put into this site to keep it continually updated. Thanks for a great site. It was a great supplement in preparing for my Certification Exam… which I passed this morning. Will definitely recommend your site for others. There are tons of resources out there but when you view them there is no way to say if they are current. I felt confident that your information was current and accurate. That’s awesome, thanks- and congrats! I need a small guidance over here. Recently I passed Admin 201 exam and today I got an email from Salesforce regarding Spring ’16 Release Exam . This is my first release exam to be taken before July. They have mentioned the below exam objectives. Number of questions will be asked is 5. So is it enough if I go through these exam objectives alone mentioned below or I have to go through the whole Admin 201 again.I am bit confused over here like how to prepare for this release exam .Can you walk me through this. Describe the capabilities of the Data Loader Tool. Describe the capabilities of the Custom Application settings. Understand the capabilities of login forensics. Maintenance exams are not proctored- you need to review the release training and release notes, but you will have time to read the release notes while taking the questions to make sure you get the right answer. Thank you for for this study guide. I have passed the Admin test yesterday in the first try. for the benefit of others – I started my SFDC journey 20 days ago, I have gone through Admin Beginner trailhead + this study guide. invested ~ 50 hrs of time. Wow… that might be a record 🙂 Congrats Isidore! Thank you for this awesome study guide! I passed my Admin Exam today first try!! This resource was critical in my success and was such a fantastic guideline for organizing all the material. VERY helpful. The scenarios were key!!! It was well worth the cost and I look forward to using your resources as I look to achieve other certifications in the future. Hey Bethan – congrats! And thanks for sharing! I passed the 201 certification last week and would like to share with others that your website was the only study resource I used. Thank you for putting together this site for the community! Congrats Matt! And thanks for sharing! Thank you so much for putting this guide together. I passed my exam today thanks to you! This is an incredible resource for filling in any gaps in knowledge required for the certification. More than worth the price. Thanks! That’s awesome- congrats! And thanks for the feedback! I passed my ADM(201), in my 2 nd attempt, and all credit surely goes to COD. Thank u thank u thank u for bringing up this knowledge site. More then worth of what I paid to u . And also recommendEd to many of my friend because I m sure h r supposed is always the there , and this sight is perfect source to learn admin part of salesforce, just want to ask that do u have any plans for such kind of site for DEV(401)? Or in near future plan . Pls let us know, I would love to learn from perfect resource rather then tumbling along other sites. Tejal- congrats on the cert and for sticking with it! No plans for other guides at this stage… but maybe some time in the future. Thank you John, I passed my exam today. Used your site as the primary source of preparation. 1. Whatever theory that you study on the website, ensure that you practice it extensively on your developer org and think of other scenarios that revolve around it and try them out too. queries, the Salesforce Community is a great forum to ask queries and get your doubts clarified. think about scenarios that I had not previously thought of. kasukhelagautam@gmail.com , will be more than happy to help but within the purview of rules and conditions laid out by Salesforce certification 🙂 . Thanks a lot again John. My certification journey wouldn’t have been a breeze without the efforts that you put in bringing up such a wonderful website. Awesome, thanks for the feedback Gautam – and congrats! I passed the exam yesterday, this website has been of great help. Thanks John! I passed the exam thanks to this material! (It took 3 weeks of study only, half week practice tests, 0 previous experience with SFDC before…). It is well organized – right level of breath and depth of topics. (In fact we didn’t cover all of it in the instructor-led class itself, so that material wouldn’t have been enough now that I think of it). Thanks John for putting this up together, and pls help if you know a similar site that prepares for Sales and Service Cloud certification. in this site too.Do you have study guide for App builder or can you suggest any .It will be a great help. Just completed the App Builder migration exam. It was pretty straightforward – make sure to study order of execution (workflow, validation, process builder, etc. ), Salesforce1 layouts, Lightning Pages & Standard Components, rollup summaries and master-detail relationships, publisher actions, and the relationship between actions and page layouts / Salesforce1. All of these are addressed in the study guide. I passed my ADM 201 exam today. Your site is Awesome. The way the topics are sequenced is really helpful to have a better understanding. A big thank you for your time and effort in putting together this awesome site. I would like to take the Service Cloud exam in the next 6 months, any pointers where to look for a study guide? Congrats Lakshmikanth! I don’t have any advice to share for the Service Cloud exam I’m afraid. Good luck! Today I gave my first attempt . But didn’t make it, but sure after giving that I really feel this is the perfact guide to use for adm(201) , u really not need to go and search any whare ,,, even though few topics r really enforeced in exam from new release . And sure john included them here and I think it’s really worth of reading for 201 exam, my suggestion is to read this guide for sure but still think each concept much analytical way . Then only one can clear this exam. And that’s what i felt today. Anyways I will be keep reading and thinking all possible ways of each single topic. Thank you for giving us good guide John . Hey Tejal- sorry you didn’t get through it on your first attempt… can’t say that’s completely uncommon. If you aren’t spending a lot of time in the application, I would definitely recommend doing so. Also, spend so more time using Trailhead if you haven’t completed all of the admin modules. Lastly, using some of the flash card sites can help IF you double check every question they present. Good luck on your next attempt! I am planning to take up Salesforce Admin exam and been going through Salesforce trail heads as a first step and in course of time I have come across this site. Example : For Standard Navigation section the video length is around 2 min and a quiz for 4 questions and it is marked as free. Will it remain same even for the purchased version. Please do not double post on this site. Today I failed the 201 Admin Exam for the 2nd time. The admin guide was so broad that I was literally studying up to the last minute and still failed 2 weeks after I failed the first time. Got caught up with questions regarding the questions surrounding the Service and Sales Cloud Application, which I felt were the bulk of my questions. I’ve been working in SF for for over 3 years now, and I’m getting caught up on questions on features and out of the box options that our company doesn’t even use. I’m so fed up with their training content and guide. I had a question about Salesforce Classic Lite (I specifically wrote this down during the exam three times so I would remember it) and what accounts are transfer over to it. I hope I can pass with the use of your application. I hope so too. Good luck on your next attempt- I think this site will certainly help. I would definitely read the tips on final section on exam taking as well. Should one revise the content in the order provided? I am considering revising the content in the order of weight in the exam. The site is definitely build with exam %s in mind, and ordered similarly to the Salesforce study guide. still want some short video or some detail about it. I passed the on the exam on some days ago after only 42 mins. This site contents definitely helped me a lots though doing the questions (cheap packages I found online) helped me more ( just the type of person I am). Thank you John Coppedge for helping me understand the foundations of all the topics (I have to go back and forth many times between your topics to understand the questions I did). Suggestion: A quick update of Winter 16 questions’ topic would help a lot, I believe SFDC added some topics that were not covered here due to the new features- cant blame you though. Awesome congrats on the pass! What other resources did you use? Update underway- will probably be done in conjunction with the Spring 16 release. Hi John I just passed my ADM 201 certification exam this morning on the first try, thanks to this site. This was well worth the fee! DEV certification next! Any similar solution for the DEV exam. I must say it was this site and its content that gave me confidence to attempt the exam. Very well maintained and helps understand most of the concepts. Hi Vinit, can you pl advise on the exam pattern? Though most of the questions given on this site are correctly answered, still I would suggest to reverify those from official Salesforce documentation. That would help you to understand the logic behind the answers. Trailhead is also good option to go along with these. As already confirmed by John in one of the comments, for questions that have multiple answers they always specify how many answers to select which is very useful. just found little more information for ADM exam, i would like to share with you here. Thank you for all you do to make us learn Salesforce. For all of you studying for Winter 16 salesforce admin just a few points. I think for winter 16 they have made the exam much tougher than any sample questions you may encounter. I studied all the topics in this guide I even did a number of the could sections. What I saw in my exam today was that the questions sf gave were insanely difficult. Every question was a scenario of some sort, I even wondered if it was the advanced admin. There were no straight forward questions. I was expecting questions like “If you want to use customized fiscal periods what do you need to turn on?” But instead without giving away the actual question you have stuff …. So and so company uses salesforce outlook and have encountered sync issues between certain entities please chose the answers below which may resolve these issues. I obviously failed despite the 6 weeks of study but now I look at the advanced admin question I see 99% look similar to what I had to deal with today…Maybe my test centre has mixed the titles for the exams.. All I know is that even if I had an open book I would have failed. Im not sure I will try again because the questions were so so hard and had nothing in common the level of the certified admin questions you encounter on salesforce study guide or all the various sample questions. Thanks for the feedback- I’ve been some feedback like this on the Winter 16 version of the exam specifically. Historically, I believe the practice questions on this site have been good representation (and the vast majority of feedback received matches this assessment). -I believe the questions are derived from a bank of a larger set of questions (e.g. a bank of 600 questions, you get 60 for the exam). You may have simply had bad luck and gotten 60 hard questions. -The Winter 16 exam may in fact be significantly more difficult- this may get adjusted downward in future exams if that’s the case. Having little to no separation between the admin/advanced admin exams would not make much sense. -How much time have you spent in the org configuring things? Studying is helpful but configuring is even better. I would definitely encourage you to try again. If anyone else has taken the exam recently, I’d love to hear your feedback. HI John Yes I think you maybe right. Maybe I got the hardest questions from the bank. I’ve checked these last hrs on teh net all sample question I can find and mine were always 3/4 lines just for one question. It was never a simple sentence. In terms of the practical side of things I have a developer account since late November. I did a lot of the trailhead stuff on it and also a large amount of the exercises from this site. I think witht eh knowledge I have right now I could probably do a decent junior admin job Ive been doing Siebel architecture since 2001. Most of the same principles as Salesforce in terms of data model, data import, admin. I would say it is definitely worth a second attempt- it sounds like you are doing the right thing to prepare for the certification exam. just want a advice from you . what we r doing is still valid? i mean ADM(201) certification is still available to give or we need to take our topic selection different way? i m confuse at this point!! just putting down the link that speak out the topics in Study guide for Platform App Builder. ADM201 (certified administrator) is here to stay, and will remain an excellent starting point. The App Builder certification is replacing the Developer certification (DEV401) and is appropriate for those that are heading into an architect or programmatic developer role. Your reply really means a lot to me. i m back on my ADM(201), as its for Admin , and as my interest for now, BUT not DEV(201) for now. I’d skim the release notes- the BIG change to be aware of is the Lightning UI. That’s probably 50% of the release notes right there. Thanks, this site has been resourceful for the ADM 201. Any plans on DEV 401 ? Hello Hariharan or anyone! Has anyone attempted the exam recently? I have been going through John’s website and it’s excellent. Need to know if we have to prep anything additional? Hi John ; I am new to SF… have started off on Trailhead and now purchased your study material. Is there any advice ? Also looking to be in touch with another newbie like me? I saw you posted that you were having a problem on a quiz as well- there are currently no site issues to my knowledge. Have you tried another browser? Also if you have previously purchased, then the site will not let you do so twice (as you already have access to the content). Thank you so much for putting together this site. I failed the 201 exam the first time and found your site when I was searching for additional study resources. $40 well spent. Passed the exam today! Awesome, thanks for posting. And congrats on passing!! Is the content ready, as per the recent changes? Planning to take up the course. Working on the Winter 16 updates- not complete. If you read the release notes and become familiar with the Lightning UI you should be in good shape. Hopefully soon- if you review the release notes you should be in good shape. Most of the release focus is around he lightning ui. Great resource John. I passed. I just want to add that i signed up for the exam on Christmas day as “potential” gift to myself, purchased your study guide on the same day, and passed today. Thank you! Thank you. I went over the quizzes and the practice exam over and over and over and over again to the point where i not only knew the answer based on keywords but i was eventually able to fully understand the question, the answer, and explain it to myself. John did a great job explaining both right and wrong answers so make sure you understand the answers(John’s explanations) and not just focus on choosing the right checkbox(es). Good luck!! Amazing site,passed my ADM certification .Thanks John!!!! Great product! It is perfect for that final review before taking the test. I walked in feeling confident after studying with Certified on Demand! Hi John, I have following questions on Serivce Cloud section , Can you please help me in finding the correct answer for followings. 1) Do you know what is the primary function of a private branch exchange. 2) Knowledge article life cycle consists of five stages. In which order does an article proceed through these stages. 3) What are the metrics to be analyzed by contact center manager to measure the efficiency of its contact center. 4) What are the basic concepts of Knowledge-Centered Support (KCS). These are related to the Service Cloud exam- this level of detail should not be required for the basic admin exam. Hi John, Hope you are doing well! Look like the exam in Jan. 2016 will be WI16 version. When are you planning to finish the update? No exact date planned, but will post when complete! Crystal, did you take up the exam as yet? If yes, how was it? Hi John, I am using IE 11 to browse your site. However it is hard for me to scroll down and pick ‘AppExchange” topic. Many thanks for your advice! I have found a workaround and it works. BTW, I may need your advice about the report builder issue in my environment . Currently it (report builder) can not be enabled and everything was fine two weeks ago. I did not change any system settings. When I click New Report, Report Builder is replaced by Report Wizard . The settings for both “User Profile” and ” Report and Dashboard User Interface” look good. Many thanks for your comments! Hey John, Passed the ADM-201 exam last week!!! This is a great website that covers everything you need to pass. Do you provide an Advanced Admin. exam study guide? If not, could you point me in the right direction? Congrats Ken! No advanced admin guide at this stage… I would look at Trailhead and other resources in the community. I plan to take the exam in first week of Jan 2016. Does the exam scope includes Lightning modules? Would this training guide also covers lightning modules? thanks for your time John. I passed the exam last week on my first attempt, and your site is greatly responsible for this accomplishment. Thank you so much for all your time, energy, and attention to it. If you’re ever in Chicago, I’d love to buy you a drink! That’s awesome, congrats Margo! Appreciate the feedback! hi john ,Just want to know if you are upgrading with this lightning experience guide and effects nad other new topics as per winter ’16 . here is the link.and if you are doing it soon will help us alot.. Thanks for the link! Yes the content will get updated, likely later this month. Just curious, where are you getting the estimate for 6-10% impact? I only saw a small change to the study guide. As far as Adm 201 is concerned, is there a big difference between last release and winter 16 release? Does it contain advance topics like Lightening Components? I will be taking my Admin 201 test on Dec 21st and it’s for the Winter 16 release, what do you recommend I use along with your site to study for the Winter 16 release? Thanks in advance. I took the 201 exam 2 weeks back and passed. I used this site extensively. Hi Sampada! how was the exam? Was this site enough? few days back I saw updates on developer edition ,…there is winter 16’for developer ,,, already updated I think…can you please if some additional change we need to know . Hi John, I understand it’s a one time fee. Does the material hold good if I plan to take early next year? I update the materials on a regular basis with each release – so yes you will get those updates. Can anyone please recommend me some good resources for preparation of “App Builder Certification”. I passed my admin exam yesterday. your website is very helpful. Thanks mate for putting all stuff together. Hi all, not sure if I am posting this in the correct spot or not? Apologies if not. I need to know is there a way I can access SF without a license? Basically I am leaving my current employer to go travel, and I want to complete the certification while I am travelling – but given I wont be employed by a company using SF, how can I access SF to complete the study guide on here & prepare for the exam? I want to have the certification completed by the time I finish traveling so its complete when I commence my job hunt. You can sign up for the Developer edition org for free – this is in the getting started section. This will provide you with 2 licenses to Salesforce for free indefinitely. Yes – you need a license to access Salesforce. However, with a Developer edition org you can still learn without being attached to a licensed employer. I just passed the exam!!!! Your site is fantastic! This is my process for those who are curious. I went through the Guide. It took at least 2 (or more) months of making sure I understood everything. Then I went through the quizes again and review some of the harder concepts. Then I took the 20 min test quiz at http://www.salesforceben.com. After that I took the quiz here and passed with a 75%. Then at Salesforceben I took the full test and passed. After that I took 2 more practice exams. I can’t find the site. But if I do I’ll post it. The key for me is understanding everything on this site then allowing the practice exams to gain practice and also identify week areas. I went through the test and marked all the ones I wasn’t sure about. Then went through those again. After that I flashed through the entire test for the last 20 min to make sure I put my best answers down. I don’t know how well I passed. But, if I judged by how hard the questions were I would say I barely made it past 65% Once again… Thanks If you make a guide for the Advanced Admin let me know. I will quickly put my money down!! Congrats! And thanks for the feedback, I’m stoked the site helped! You approach is very similar to how I approach exams as well, glad it worked! John I must have asked this question somewhere else but can you please let me know :1) when you plan to incorporate Winter ’16 release functionality as it relates to this exam and 2) are the release notes (http://releasenotes.docs.salesforce.com/en-us/winter16/release-notes/salesforce_release_notes.htm?edition=&impact= )for this new release sufficient to be prepared for the new ADM 201 exam after November 16th. i am planning to take the exam mid December. It looks like the new release is quite comprehensive with Lightning, Wave analytics, customization, etc. , I don’t want to fall short the day of my exam. Would be grateful for any advice. Probably towards the end of the year – I’ll post when completed. You’ll see when you register for the exam what version it is for – at the moment the SU15 (Summer 15) exam is still active (meaning that the Salesforce certification exam doesn’t reflect Winter 16 yet). Thank you so very much for putting up this site together . I passed my Adm 201 today ! Woo hoo ! 🙂 I had taken up the exam in a short notice and I was able to clear it ‘cuz of this site ! The cohesive flow and the concise presentation of the topics really helped me a lot . This site would also serve as my reference in future. Few catch points from the exam , I prepared according the percentage of occurrence of questions , and understanding user management and security , Salesforce platform , Sales/Service cloud , Data Import helped a lot and gave me the confidence needed for exam. I realized that even though Chatter ,Content , Documentation, Knowledge Articles , Communities etc are given less importance in the StudyGuide of salesforce – understanding them and trying them out would be a good help as there are quite a few questions from these topics too. I also realized ,having a list of Exceptions to the standard funcitonality like , what would NOT allow a action to occur , for eg : the list of features which have Active checkbox , Why a picklist may not be displayed , things like that would help from exam perspective. Another note , Validation/Workflow precedence and knowing when to use which kind of component for Dashboard would really help. Thanks a ton John !! Thanks for the feedback and congrats on passing! I’ve heard the dashboard piece before, I will work on that! – Personally, I did the administrator trailheads and studied this guide extensively. Studying this guide alone took me about 35 hours. I checked out the must-sections, most of the should-sections and some of the could-sections. Just studying the Key Facts and the musts is – in my experience – inssufficient. The questions are sometimes quite tricky and often very detailed, asking about specific settings and such. The trailheads are useful if you actually watch every video and read the text attentively. I mostly went for the assignments, so for me trailhead didn’t make a difference. – With respect to subjects, I think this guide has insufficient focus on Dashboards. Make sure you check out the various Dashboard components and what they do. That type of questions really drew me up short. – Make sure you read EVERY part of the question (and read it well). Sometimes it’s possible to apply common sense, even if you don’t know the facts. Every word matters and nuances are VERY important. I changed at least five or six questions after re-reading the question. Hi Morna thank you for your feedback and perspectives about the site. can you elaborate on how you actually studied for “Dashboards” and other sections not covered in depth here but were asked in your exam? Can you list particular areas that we must not overlook and spend more time on? Is the Service Cloud well addressed? thanks again! Interesting feedback thanks Morna, I’ll look at expanding on Dashboards. Good approach as well. well put together thank you. I have just signed up. Ultimately I want to get a Sales Cloud certification, would you offer this in the near future or may you recommend similar resources to study online? Thanks again! No plans for other guides yet, although maybe at some point in the future. 2 days ago I passed the test and want to give your site/service a big endorsement as I found it to be a great resource. I learned about CoD through the Admin 201 group on LinkedIn and can vouch that you definitely deliver as promised. I recently completed all the Admin trails on Trailhead as well, but found your material (and the way it’s presented) gave me more insight into the concepts and logic of Salesforce and confidence going into the exam. Thank you much for your effort and keep up the good work! Congrats on passing! And thanks for the positive feedback – keeps the site going! after going though this study guide,,,is this enough for both ADM201 and DAV 401 certification? This site is designed currently for the ADM201 cert. This site was very useful in my preparation for the ADM-201 certification and I have successfully passed the exam for summer’2015 in September. Thank you for this site and will always refer back to this site in future as well for quick references and future releases. After 3 months of effort , i successfully cleared the admin certification on my first attempt on OCT 9th with out having any knowledge of sales force. I have no clue how to start preparing for the exam and i am so lucky that i found this site. Its worth all the money. Would like to thank John for this great site , which made me understand the topics very easily and also want to appreciate the way he managed with the recent release as well. I read all the topic including all the ‘could’ as well around 2 times and reviewed all the flash cards etc. My main source of preparation is this site. That’s awesome Dharani – glad the site helped, thanks for the feedback. And congrats on your cert! I passed my certification Admin 201 yesterday…Thanks a lot john.. When do you think you’ll have updated your site with material about the Winter ’16 release? I’m not trying to hurry you. I just know that what you include on your site will be a great resource for this rather significant release. Passed my 201 on Sunday so a massive thank you for what you have done here. In my job current role I have performed ad hoc admin duties for 4 user professional org that only uses a tiny amount of the platform for a couple of years. Your site has helped give me the confidence and drive to learn salesforce to a level where I want to make a career out of it. Thanks Ralph and congrats! App Builder is probably going to be easier to get- although advanced admin will probably force you learn more content. Either is certainly valuable although I would probably lean towards advanced admin. Can you share the level of difficulty, is it all scenario based or straight forward questions etc? As i am planning to give a go on this month. I found there was a fairly even mixture Dharani from what I remember , many were much like John’s scenario questions but there were also quite a few that were more like the flashcards you find on other sites .Good luck! I had successfully cleared my admin 201 exam and to repeat others quote here, this is the best investment to make if you are looking to gain SFDC knowledge. I am guilty of skipping some of the “Could” sections in the tutorial and I am going to start with them again. John it would be a great service if you can come up with a similar tutorial for SFDC advanced admin 301 certification as well. I will be one of the first takers! That’s awesome Rajesh, congrats! And thanks for the feedback- considering other guides in the future for sure. This site is awesome. Best $40 I have spent! I passed my exam and plan to continue to use this site as a resource.